rtist and sculptor Gerry Judah is matter-of-fact about an unusual aspect of one commission. “I had to create a triumphal arch to hang a Ferrari.” Such is the work he is used to now. 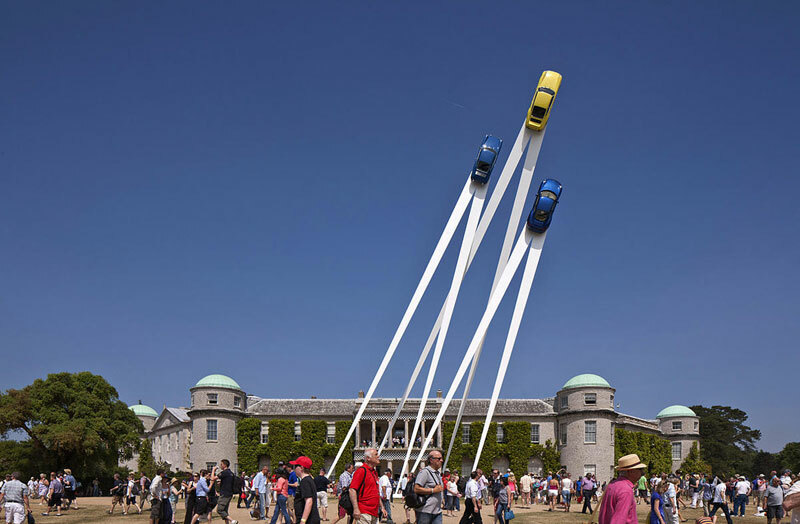 Since 1997, Judah has been building enormous, car-themed structures for the annual Goodwood Festival of Speed, held in the grounds of the Goodwood Estate in the English county of Sussex. 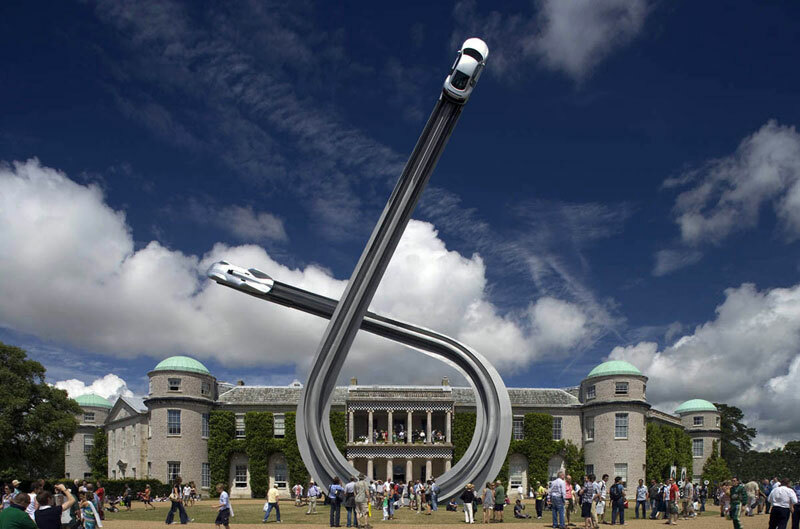 Apart from stringing up Ferraris, he has bolted Range Rovers to giant metal structures that tower over the stately Goodwood House, and attached priceless, pre-Second World War Auto Union racers and modern Audi R8 supercars to equally huge creations that look like giant Scalextric tracks twisting and shooting into the air. These and the other installations he has built for the likes of Honda, Ford, Jaguar, Mercedes-Benz and Rolls-Royce are commercial commissions, with all the delicate negotiations that this entails. But Judah insists corporate sponsorship hasn’t led to corporate interference. “They all want to do something exciting and they want to market themselves well, but they’re not sculptural patrons and they’ve given me a free hand with proposals and allowed me to be as creative as I want,” he says. And that’s pretty much how the working relationship between the motorsport-loving, festival-running peer of the realm and the artist and sculptor has continued. “There are restrictions when you’re building a sculpture the size of an oil rig a few feet from a stately home, with 120,000-plus people walking underneath it. You have to know about things like wind loads,” says Judah. Much as he’d love to use materials like cloth, it’s for this reason that all his Goodwood creations are metal fabrications. “I work with some fantastic engineers and fabricators, so this is very much a collaborative effort.” He says the huge Land Rover “boulder” from 2008 is an example of this. “I wanted to make something that looked like a massive rock, with the contradiction that you could see through it.” This involved a lot of discussions about using complex joints, or sheets of steel (“like an egg carton”). In the end, giant steel tubes were chosen. “I work with people like Bill Tustin from Littlehampton Welding. He knows everything there is to know about steel, and I get the details right working it out with him,” says Judah. “You need to work with people from different disciplines. They help you create an illusion and a sense of magic. Like every magician, you’ve got to work out your tricks so they don’t collapse on you.” Judah and his team of engineers and artisans haven’t been excluded from the odd hair-raising moment though. 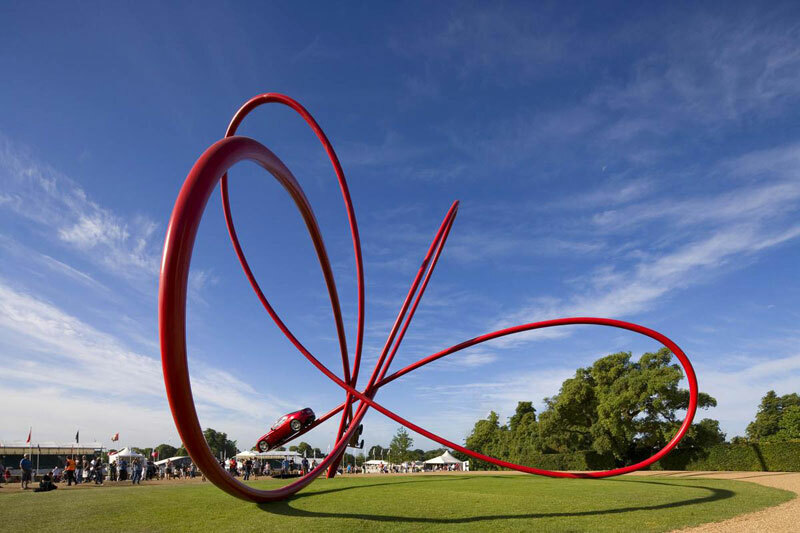 In 2001, he had produced a huge installation featuring a swooping 1950s Mercedes 300SL gullwing coupe that was nearing completion when a fabricator rang to ask if it had been earthed to the ground, as a very large thunderstorm was heading its way. With visions of a rare, expensive old car and a fathomlessly priceless stately home being fried by a lightning bolt, Judah dispatched a van with a lightning rod, which was hotly pursued by the inclement weather all the way to Goodwood. Fortunately the van got there first. Despite the horror stories of trying to paint massive, extravagantly shaped steel creations in rain-lashed “force-11 gales” as deadlines tick away, he clearly enjoys the work. “A good idea can take a long time, but a great idea can take a moment,” he says. “For instance, the Audi ‘Swoop’ came into my head when I was on a London bus between Oxford Circus and Portland Place; so I sketched and emailed this to the engineers.” He’s a huge fan of the Internet and other modern means of communication as a means of quickly working on ideas with people in different parts of the country. “Often, we’re pretty much designing on a Blackberry,” he says. Judah says that he “loves cars”, but from an artistic rather than a vehicle enthusiast’s perspective. Put crudely, he likes their shapes. “Often when I’m talking to clients, I have no idea about the cars they’re discussing, but every time I do one of these things, I learn more.” This year’s display will feature Italian car maker Alfa Romeo. It has a new model, the Giuletta hatchback – which made its debut at Goodwood – and the marque is celebrating its centenary this year. Alfa’s installation will feature a modern 8c coupe and a classic P2 racing car, and will echo the marque’s four-leaf clover emblem. He describes the 8c as “curvaceous,” and says that he hopes the structure will pick up on this. It will, inevitably, be in “Alfa red”, and Judah talks about “lines of steel dynamically moving round each other”. He clearly enjoys creating these giant structures, and it’s commercial work of this sort that has allowed him to produce the war paintings that he describes as “my real journey. The two sort of run in parallel”. Cars often don’t get great press, thanks to a mix of environmental and social issues. So it’s perhaps ironic that the super-rich racing classic cars at a stately British home has allowed an artist whose worked for organisations like Amnesty International to produce some of his best-known work. 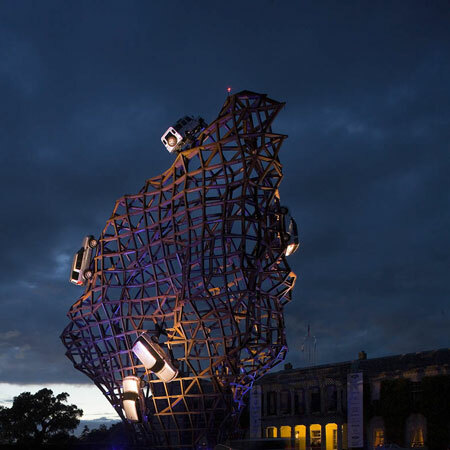 “I think Goodwood is the only place where seriously exciting, adventurous sculpture is being done on this level,” he says.